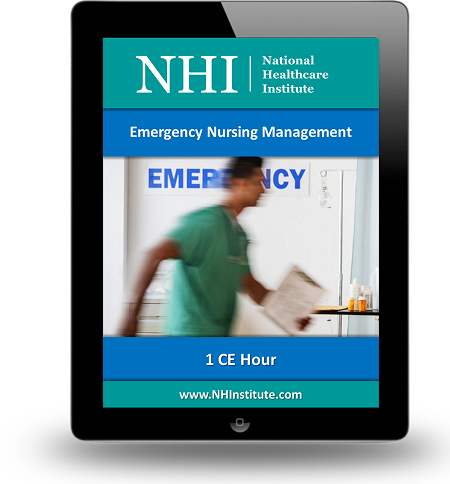 This course focuses on triage, initial assessment, and management of the emergency patient. In addition, it presents an overview of issues related to violence, terrorism, and emergency and disaster preparedness. Complete and submit the course evaluation survey. Other requirements for some of the courses may also include participation discussion boards, practice exercises, practice questions, etc. Conflict of Interest (or lack thereof) for Planners, Authors and Presenters. A conflict of interest exists if any individual/entity that is in a position to influence the content, design, or implementation of the CNE activity is ALSO in a position to benefit financially from the success of a CE activity. The planners, authors and presenters of this CNE activity have disclosed no conflict of interest including no relevant financial relationships with any commercial companies pertaining to this CNE activity. There is no commercial company or sponsor support for this CE activity. The CE provider approval status refers only to continuing nursing education activities and does not imply that there is a real or implied endorsement of any product, service, or company referred to in this activity nor of any company subsidizing costs related to the activity. This CE activity does not include any unannounced information about off-label use of a product for a purpose other than that for which it was approved by the Food and Drug Administration (FDA). Nursing Board Approvals National Healthcare Institute (NHI) is an approved provider of continuing nursing education by the California, Florida and District of Columbia Board of Nursing. All CE courses offer by National Healthcare Institute follow the standards recommended by the American Nurses Credentialing Center’s Commission on Accreditation for this type of educational activities. * Please note that the California Board of Registered Nursing (aka Registered Nursing Program) does not approve individual courses; however, as an approved CE provider (CA Provider 15701), National Healthcare Institute offers course content and utilize instructors who meet the requirements of Sections 1456 and 1457, Title 16, of the·California Code of Regulations in order to meet the CE requirements for nurses in the State of California. CE Learning Network is a learning community for the healthcare industry. Our mission at the CE Learning Network is to provide learning tools, training resources, and evidence-based guidance for healthcare professionals. With more than 500,000 registered learners across multiple partner educational institutions, CE Learning Network is a truly multi-focused learning experience intended to support lifelong learning. © 2015-2017 CE Learning Network, LLC. All Rights Reserved.